"Best Island in the U.S."
Thanks to our amazing visitors and local residents, Hilton Head Island has become an award-winning destination. Recently named 2019's "South's Best Beach Town" by readers of Southern Living, the accolades for Hilton Head Island tell a great story: there truly is something for everyone here in the coastal Lowcountry of South Carolina. Hilton Head Island was voted the "#1 Island in the U.S." in the 31st Annual Condé Nast Traveler Readers’ Choice Awards, as well. Chosen by over 429,000 readers who submitted millions of ratings and tens of thousands of comments, the Readers’ Choice Awards represent the very best of destinations in the world—and this is the second year in a row we have won this prestigious award. In addition to this accolade, Hilton Head Island was also recognized in 2018 as the "#1 Island in the Continental U.S." What makes this even more thrilling is that this is the third consecutive year that we have been honored with this award by readers of Travel + Leisure Magazine. To all of you who voted for us, thank you very much. We can’t wait to see you again! And for those of you who have yet to visit America’s Favorite Island, we invite you to discover for yourself our many award-winning experiences, activities, and attractions. 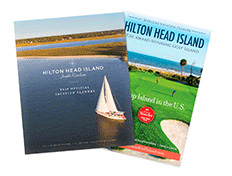 From golf getaways to weekend road trips to family vacations, a world of treasured moments and unforgettable memories are waiting for you on Hilton Head Island. Start planning your great escape today! Travel + Leisure ® and World’s Best Awards are trademarks of Time Inc. Affluent Media Group and used under license. From Travel + Leisure Magazine, August 2017 © Time Inc. Affluent Media Group. Used under license. Travel + Leisure and Time Inc. Affluent Media Group are not affiliated with, and do not endorse products or services of, Licensee. It’s time to relax and unwind. Time to indulge in the very best of what life has to offer. Time for a new adventure, a new experience. Time to make unforgettable memories. It’s time to discover America’s favorite island for yourself.